German Orientalist; born at Cassel Oct. 29, 1844; died at Strasburg Jan. 31, 1884. He was educated at the universities of Leipsic, Berlin, and Tübingen, graduating (Ph.D.) in 1867. His doctor's dissertation, "Der VIIte Prapâṭhaka des Sâmaveda-Ârcika in der Naigeya-Çakhâ Nebst Andern Mitteilungen über Dieselbe," published in the "Monatsberichte der Königlichen Preussischen Akademie der Wissenschaften" (1868, pp. 228-248), was an edition of the single portion which has been preserved of the Kâuthuma recension of the Sama-Veda. Goldschmidt continued his studies, first at Göttingen and later in Paris, where he gained a thorough mastery of the French language. On the outbreak of the Franco-Prussian war he returned to Germany and enrolled as a volunteer. He took part in the siege of Paris. 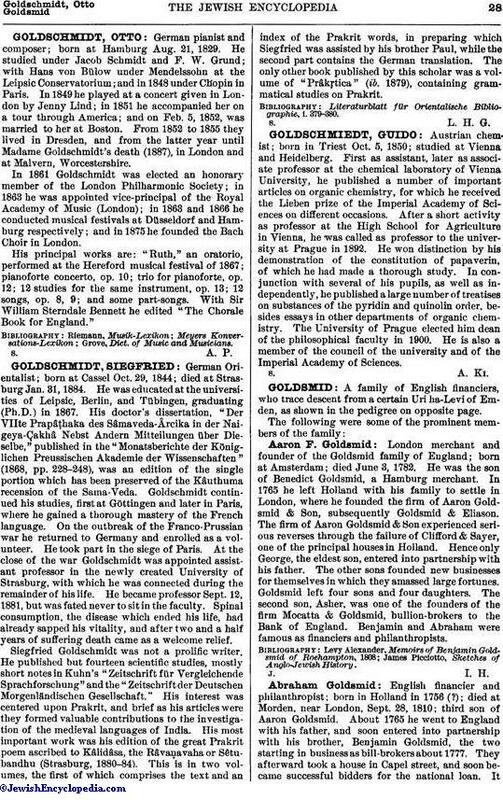 At the close of the war Goldschmidt was appointed assistant professor in the newly created University of Strasburg, with which he was connected during the remainder of his life. He became professor Sept. 12, 1881, but was fated never to sit in the faculty. Spinal consumption, the disease which ended his life, had already sapped his vitality, and after two and a half years of suffering death came as a welcome relief. Siegfried Goldschmidt was not a prolific writer. He published but fourteen scientific studies, mostly short notes in Kuhn's "Zeitschrift für Vergleichende Sprachforschung" and the "Zeitschriftder Deutschen Morgenländischen Gesellschaft." His interest was centered upon Prakrit, and brief as his articles were they formed valuable contributions to the investigation of the medieval languages of India. His most important work was his edition of the great Prakrit poem ascribed to Kâlidâsa, the Râvaṇavaha or Sêtubandhu (Strasburg, 1880-84). This is in two volumes, the first of which comprises the text and an index of the Prakrit words, in preparing which Siegfried was assisted by his brother Paul, while the second part contains the German translation. The only other book published by this scholar was a volume of "Prâkṛtica" (ib. 1879), containing grammatical studies on Prakrit. Literaturblatt für Orientalische Bibliographie, i. 379-380.